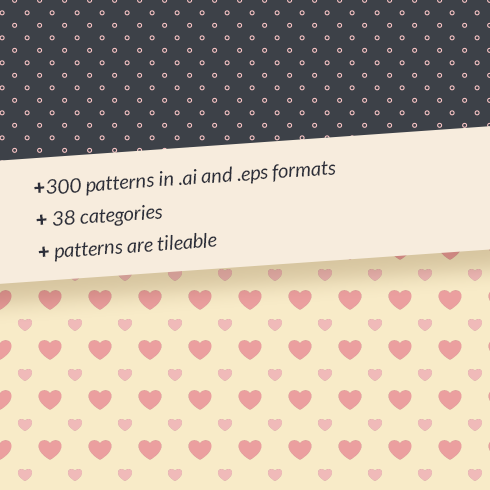 Patterns are one of the most wanted, but difficult design resource to create. Each pixel must be aligned perfectly, making you spend countless hours drawing, redrawing and changing the main element until it is perfect. 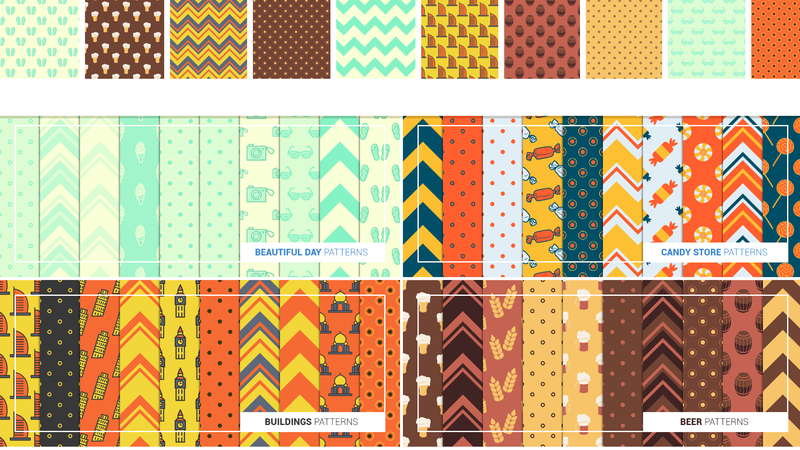 Wanting to help you, we’re bringing you this HUGE collection of high-quality seamless patterns. You will get 30 different vectors packs, with a total of 300 patterns, such as: flowers, summer, medical, nature, fruits, sports, travel, wedding and so many more! Being 100% vectors you can easily resize or modify them without losing quality. Plus, the extended license allows you to use these resources in an unlimited number of personal and commercial projects, without paying any additional fees! 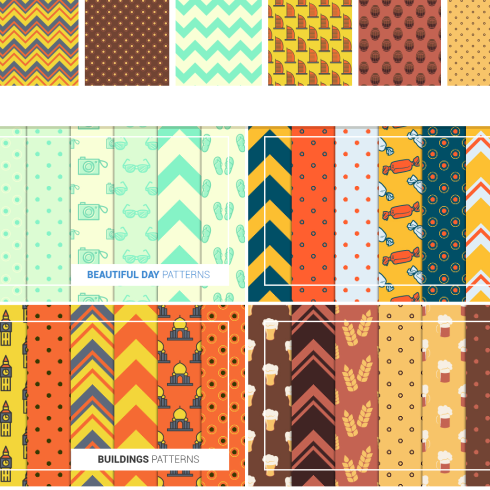 And the great news is that you can add these seamless patterns to your collection for only $25 – that’s less than 1 cent per item! In general, textures are graphic patterns that replicate a some real-life object or surface. For instance, there are plenty of folded paper and wood plank textures in different designs. Cement, leather or rock ones are also in demand. Textures frequently are made up of repeated images although they appear like they are unique and accidental. The application of texture vectors is not limited to making backgrounds, their characteristics can be integrated into any interface element. With texture patterns, we can easily create an impression of particular natural qualities, form levels, and make highlights. A pattern can be seen as canvas that contains recurrent pictures. Web design patterns are most liked for being lightweight and adjustable to various screen resolutions. It’s easy to come up with unique vivid backgrounds and highlight separate components by making use of patterns. Lots of website designers decide on patterns over high quality pictures to make website backgrounds for the reason that they are very diverse, stunning, and simple to make use of. Patterns help to compose excellent and efficient designs. Adding a beautiful pattern or a sophisticated texture can completely transform the visual appeal of any design. The prices of textures and patterns vary from four to fifty dollars depending on their difficulty and originality. We provide the most varied sets on Master Bundles. They differ in price, so everyone will find a product to match their resources. A package is a pack of graphics or some other design components that are offered together. The best thing about these item bundles is their price tag. A set will cost many times less than each product if sold separately. Often, a package will include everything you need to accomplish a design project. These offers are limited in time, so don’t miss your chance to get effective design resources and save money. 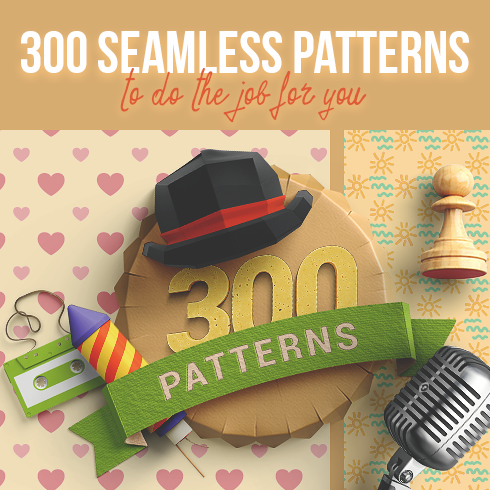 Why 300 Seamless Patterns that Do the Job for You are essential? Let’s say I didn’t locate the product I needed in the package deal? Not every design bundle carries items you need which is really common. Bundles are created for various objectives and for a different style. However, MasterBundles.com website features a large number of deals for each and every occasion, so if a given product bundle doesn’t include all the products you need – you are welcome to check the other bundles. There’s so many of them, that it is almost certain you’ll discover something suitable. Can I get any additional deals on MasterBundles.com? All the bundles you find on the Master Bundles are made by experienced graphic designers and have gone through in-depth QC. The bundles come with typefaces, graphics, WordPress web themes, icons, PSD templates, mockups, Facebook themes. Additionally, there are stock pictures, illustrations, PowerPoint templates and CVs, photo overlays and indesign deals. There are special deals that cost lower than 5 dollars and festive web templates packs. Masterbundles is an internet marketplace. On our website, professional graphic designers promote their masterpieces at the best prices. We offer the best deals on the market, and our products are highly reviewed by customers. Have a look at our blog, it truly is loaded with practical information for professional designers. Additionally, in case you subscribe to our newsletter, you will be the first to learn about our special discounts. There are always coupon codes and promo codes offered to lower the prices to a minimum.